On March 9, 2013, The Visayan Eskrima Guild offered its inaugural Filipino martial arts seminar. The seminar was held at Williams Martial Arts Academy, graciously hosted by Grandmaster Wade Williams and his son, Professor Keenan Williams. In attendance were four other Founding Plank Holders of the Guild – Visayan Style adepts Steve Magness, Chris Suboreau, Steve Van Manen and George Yore. 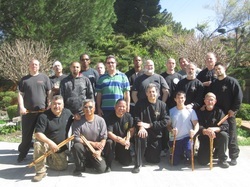 A crisp and beautiful day in the Valley – this event was attended by enthusiastic participants more than willing to explore elements of the curriculum of the day – the Visayan Style eskrima system founded by Grandmaster Sonny Umpad. The instructors wasted no time; these six gentlemen worked in harmony; their love of the material clear for all to see. The training began with Visayan Style double stick work – signature techniques linked to body angulation that employ evasive redirection maneuvers, spring loaded strikes, direct thrusts and sweeping slashes/strikes that can be used in a variety of combat ranges. Ample time was allotted so as to attend to the personal needs of each student. The second half of the seminar remained focused on the single stick – direct and effective strikes, blocks and counters. Acute emphasis was placed on flanking the opponent, as well as the utilization of deceptive close quarter and medium range striking combinations. Clear emphasis was placed on footwork, anatomical alignment and “live hand” orientation. It was a beautiful sight to behold as participants became more skilled and developed their timing during this section, under the guidance and watchful eye of the instructors. The third area of investigation was exposure to Visayan Style blade work utilizing the pinute short sword – a mainstay of the system. Since many arts profess the blade as a component of their respective systems, it is crucial to examine this element of the art. 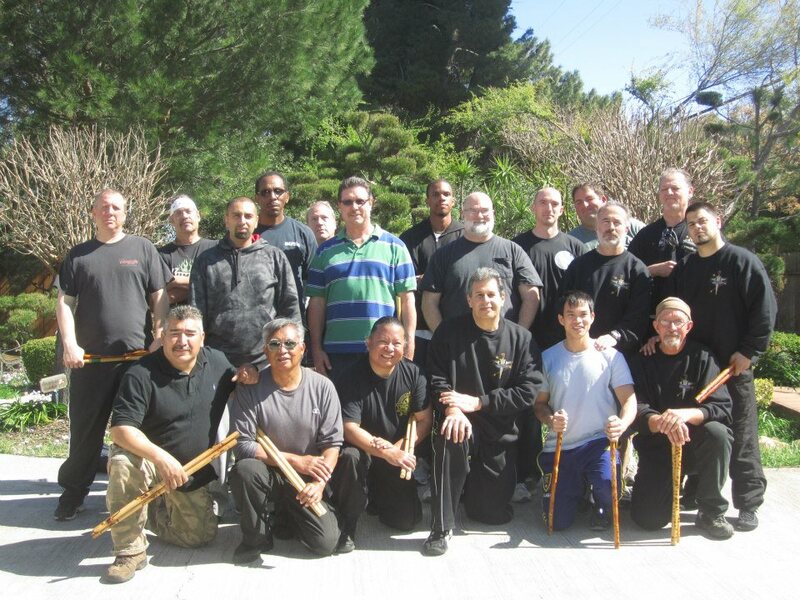 By the end of the seminar everyone had a clear appreciation of the depth of Grandmaster Umpad's eskrima system. The instructors of The Visayan Eskrima Guild saw to it that all participants had a grasp of FMA material that can be trained and incorporated into their own arts. The Guild has three more seminars on the books for 2013. These events will be held in June, August and October. Please refer to our Seminar Schedule and Current Events pages for more information about these events. We warmly extend our thanks to our brothers of arnis, eskrima and kali for their support of The Visayan Eskrima Guild. We look forward to working together in the future.